The rainy season has started in Japan and with it, huge flocks of birds have arrived in Toyota City. These birds gather in groups that easily count several hundreds of birds and make a noise like you wouldn’t believe. Every night around dusk they gather on the power lines or in the trees next to the station. It makes for an impressive sight. They never seem to sit still. Individual birds constantly come and go, while whole flocks move through the air at an amazing speed, twisting and turning as if they were one. In this video you can see them moving about and you can even get an idea of the sound they make (if you manage to mentally filter out the poor sound quality of the video). 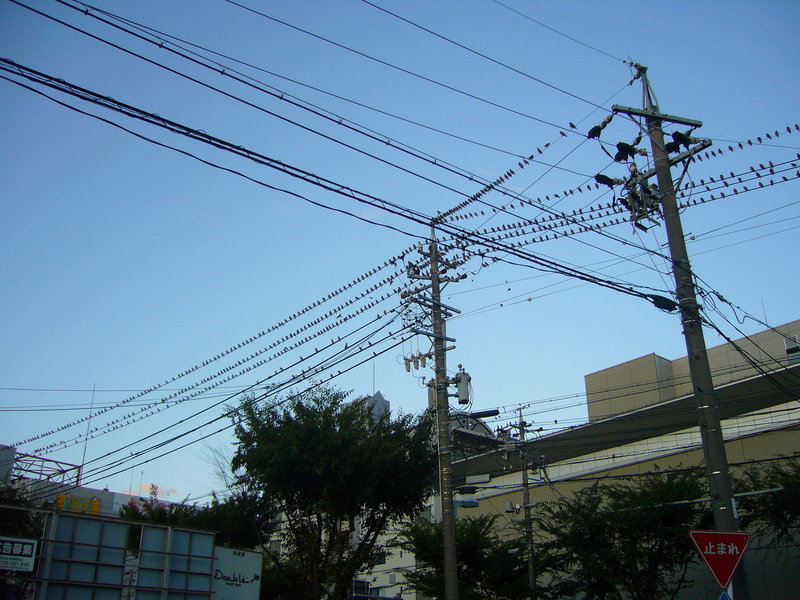 The birds have arrived in Toyota City about one or two weeks ago and they stay here all through summer. When the weather gets colder again, around October or November, they disappear. I wonder where they go. I was told that these birds are called ‘muku’ but I was unable to find any information about such birds on the internet. Does anyone know what their English or their scientific name is? The one thing that I did discover, is that ‘mukubird’ (ムクバード in Japanese) is a Pokemon. This pokemon is called ‘mukubird’ in Japanese. His English name is Staravia. This entry was posted in Japan and tagged Animals, Birds, In the streets, Summer, The seasons by Haruko-chan. Bookmark the permalink. I thought of an other thing, seeing the video. They sit in a nice order on that wire. The distance between each bird is always the same. They sit on a distance at witch they can’t pick each other. You can see it when a bird tries to land in between two others. They start to quarrel till the newcomer departs or chases one of the others. Hi Papa! That’s very interesting! 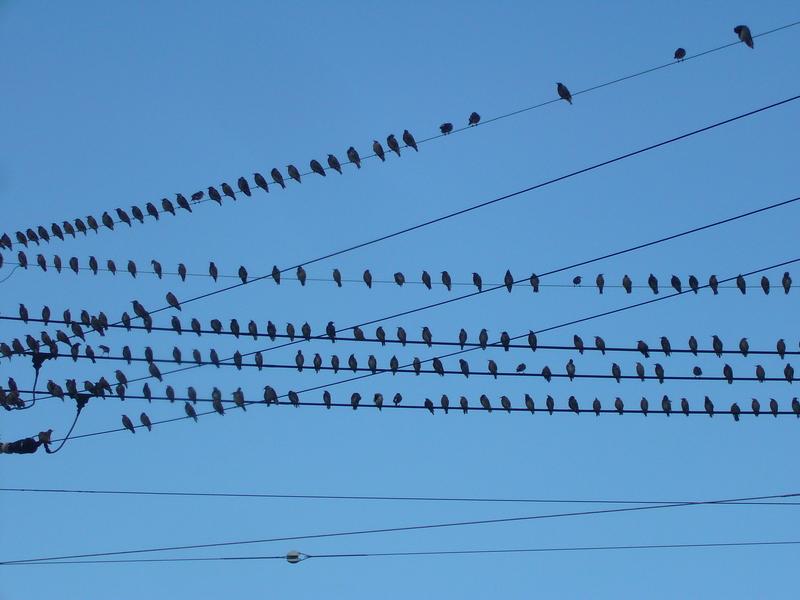 There is indeed a lot of noise and fluttering going on whenever a new birds arrives to sit on the power lines. Now I know what they are doing and why they are lined up so neatly. Thank you! Wow! That is a scary amount of birds!! I agree! Scary!!! And the noise they make, makes them even more scary. I hope they never become angry at us puny humans. I have never seen the movie ‘The Birds’ by Alfred Htichcock, but I imagine it must be something like this. Yes, that is what it kind of reminds me of as well. Never know in this time and day with the strange natural phenomenon around the world. I too think that these birds have the same behaviour as the starlings in Europe en Belgium. I don’t know if the live in Japan too. The can fly in enormous clouds at down. And than finally come to rest in trees. Rest is relative! The make a lot of noise before they go to sleep and keep there poor neighbours awake till late in the evening. We had it once in Turnhout near the castle in the middle of the town. The gathered in the trees alongside the pond around the castle. The neighbours tried to scare them away with screaming and yelling, but the birds caped moving to an other tree nearby. They even tried by chasing cats up the trees, whit the same pour result. The birds kept coming back every evening. After a week the sleepless neighbourhood was rescued by the local HI-FI shop who made two gigantic loudspeakers which produced a subsonic noise that scared the birds away definitively. Hi Papa. That’s a funny story. They are very noisy here too. Recently they have taken up the habit of sitting on the power lines above the railway tracks along our house. Whenever a train passes, they fly up and settle down again while making a lot of noise. I have made a video of it (click here). I found a map on the Wikipedia page for ‘Common Myna’ that suggests that this bird only occurs in the middle part of Japan. http://bit.ly/NAfPst Maybe that’s why you haven’t seen them in Tokyo? 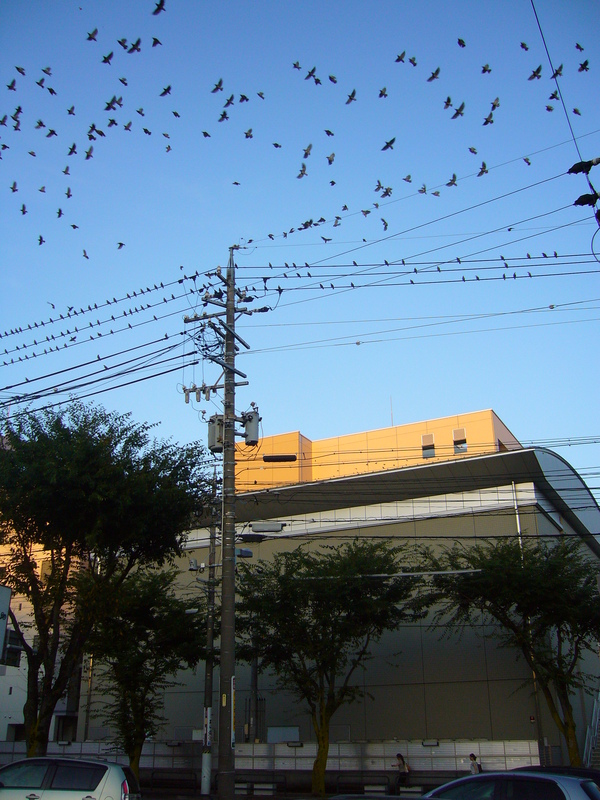 But then again, I am not sure if the birds in Toyota City are indeed ‘Common Myna’ or rather ‘White-cheeked Starlings’. All those birds! I never thought I would have such pressing need for an ornithologist.